Where to eat cheap food in Montreal? 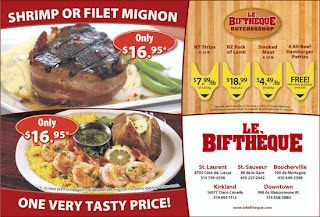 From May 27 to June 2, the Biftheque is offering a special for shrimp or filet mignon for only $16.95. This looks like a good deal to me since I had to pay more than $20 for a filet mignon the last time I went. One very tasty price indeed!